I am very very pleased with myself. In line with the whole Chinese New Year theme, I decided to try remaking a Chinese food all time favorite: dumplings or potstickers. 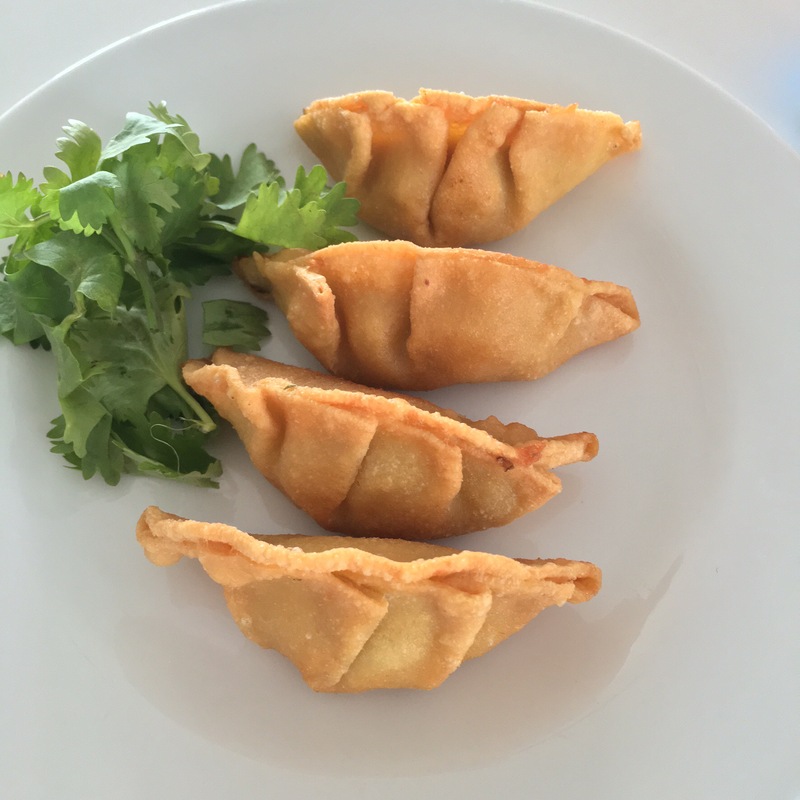 I used to make dumplings all the time…kid #1 was an insatiable dumpling monster as a preschooler. In fact, to this day he waits for every Chinese New Year where Auntie P will make her famous 饺子. Unfortunately that segment of the family is having the Lunar New Year getogether in a restaurant, which means that we miss out on this specialty this year. Trawling around the internet I also know some people are very anti-soy. I can’t quite identify with that, having grown up in Asia where soy and tofu figure in a big way in our diets. I think the phytoestrogens (natural plant hormones) in soy are feared by some people to be potentially cancer-causing, although the truth is that studies in humans have not shown any harm or increase breast cancer risk. Apparently soy also decreases post-meal triglyceride levels which is important in reducing the risks for coronary heart disease. 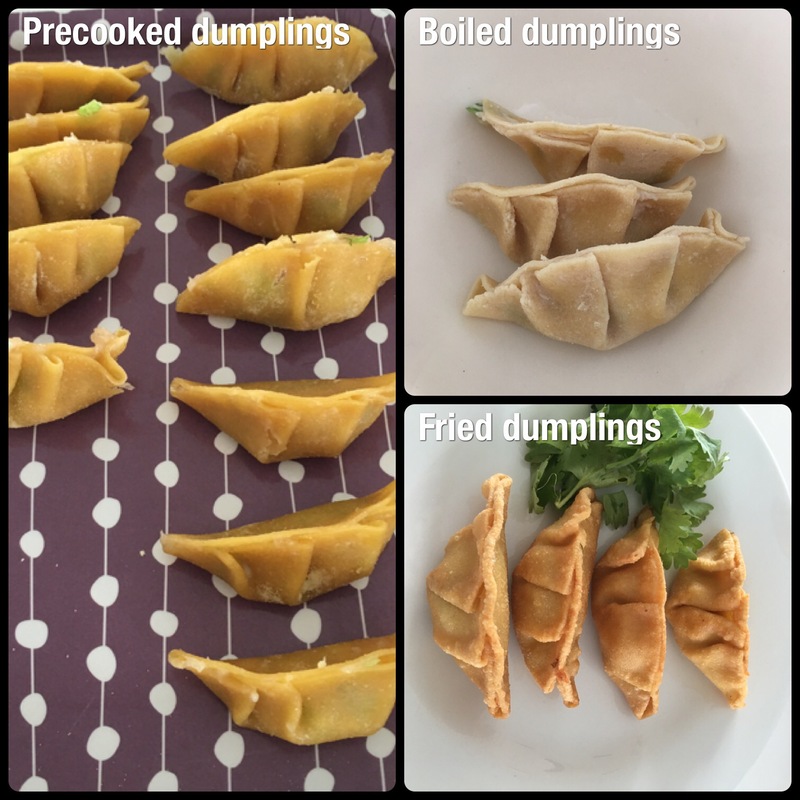 So here is the dumpling recipe using soy flour. My helper, D and I had a bit of an exciting time with the pasta machine (the dough was quite sticky at first and got stuck to the rollers) but the final results were surprisingly neat! 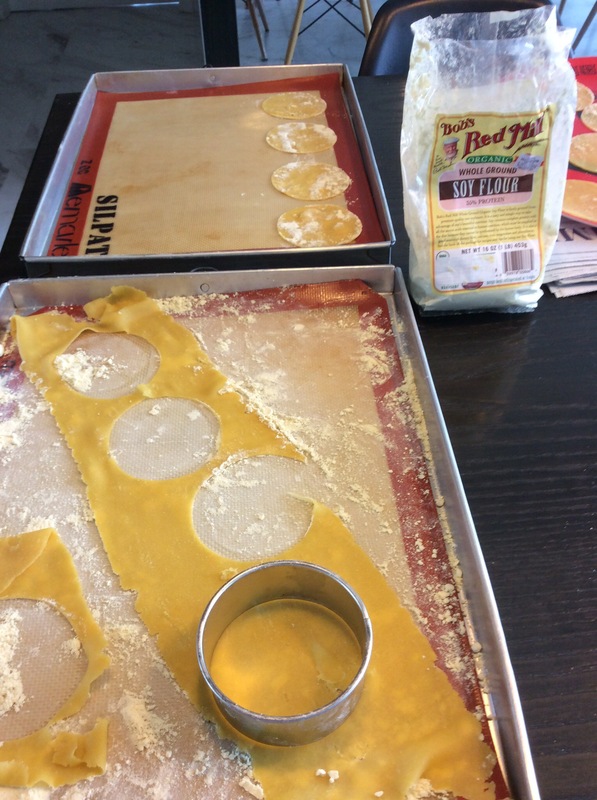 We rolled the dough out like ravioli dough, then cut out circles of dumpling skin. The circles of soy dumpling skin actually looked a little like the wonton skins you can find in the local supermarket. In the end we tried making the dumplings two ways: fried like potstickers and boiled. Both ways of cooking were fine as the dumplings held together quite well. However, the fried dumpling actually tastes and smells pretty awesome although I think the traditional boiled dumpling can probably hold its shape and flavor well in a soup. 2 dried shiitake mushrooms, soaked with hot water, then chopped finely. In a food processor, mix together the soy flour, salt, oil, water and eggs and process, forming a dough. Place dough on a clean surface that has been floured with soy flour. Knead the dough. In a pasta machine, roll out the dough into thin pieces (about setting 5 on the pasta machine). With a round cutter (about 8 cm or 3 inches diameter), cut out circles of dough and flour both sides so that the dumpling skin does not stick. In a large bowl, mix together minced chicken, chopped Napa cabbage, chopped dried mushroom, minced garlic, grated ginger, arrowroot flour, soy sauce, fish sauce, sesame oil and white pepper thoroughly. Microwave 1 tsp of the filling for 10 seconds to taste the filling and adjust the seasoning accordingly. Place 1 tsp of meat filling into the center of each dumpling wrapper. Wet the edges of the wrapper, making pleats along one side of the dumpling. For the fried version of the dumpling, heat up 3-4 tbsp of oil in a non-stick pan and then pan fry the dumplings. For the boiled version of the dumpling, bring a pot of water to a boil, then cook the dumplings until they have started floating on top of the water. Remove and drain. Serve hot with some dipping sauce (black vinegar and finely shredded young ginger). I didn’t post it but it’s 2.8g carbs and 42 calories per dumpling. The recipe makes close to 50 dumplings. I’ve tried substituting plum sauce with Japanese salted plums aka umeshu mixed in stevia water lol. sorry it’s umeboshi* not umeshu.